Unusual German comparative mountains chart incorporating a transparent theme. Die becannteren Hoehen uber der Meeres Flache in Transparenten Profilen. 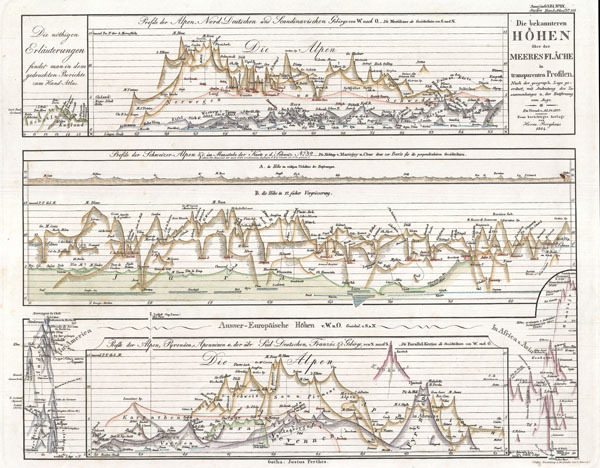 This German comparative mountains chart or map was issued by publisher Justus Perthes in 1864 and represents a style that evolved independently in Germany between 1840 and 1870. In this example mountains are shown in a transparent profile with multiple ranges overlapping. While the chart focuses on the Alps, which would have been significant to the Perthes audience, it also incorporates the mountains of America, Africa, and Asia, as well as the Caucuses, Scotland and England. While this excessively complex style of rendering comparative elevation never caught on outside of Germany, its sophisticated use of profile may have had an impact on the early 20th century comparative global elevation profiles that adorn the base of many modern school maps. Published by Justus Perthes in 1864 as plate no. 10 in Stieler's Hand Atlas. Stieler, A., Stieler's Hand Atlas, 1864 edition.